Four Oaks Elementary receives a plaque for raising the most money out of all of the elementary schools in the county for the American Heart Association last year. Pictured are Four Oaks Elementary (from left) 2015-2016 PTA Treasurer Becky Shearer, PE teacher Gardner Johnson, Principal Kathy Parrish, and American Heart Association Youth Market Associate Lori McCain. 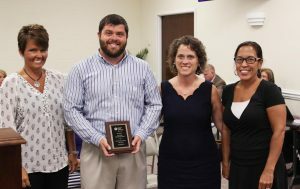 The Johnston County Schools (JCS) Board of Education celebrated its continued relationship with the American Heart Association, and the record amount of money raised by the district for the organization at its August meeting. JCS has been a proud partner with the American Heart Association for several years. Every year, elementary and middle schools participate in fundraising events such as Jump Rope for Heart and Hoops for Heart to build awareness of healthy heart habits in an effort to improve the quality of life in their communities. 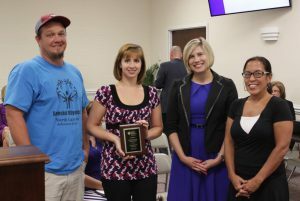 Lori McCain, Youth Market Associate for the American Heart Association, presented JCS with a banner in recognition of the continued support of the school system and the funds raised during the 2015-2016 school year at the August meeting. JCS had its most successful fundraiser for the American Heart Association, raising $178,763.78, which is more than $17,000 from the 2014-2015 school year. McGee’s Crossroads Middle receives a plaque for raising the most money out of all of the middle schools in the county for the American Heart Association last year. Pictured are McGee’s Middle PE teachers Jamie Jarman and Deborah Reece, Principal Dorlisa Johnston-Cowart, and American Heart Association Youth Market Associate Lori McCain. Four Oaks Elementary earned the highest amount for elementary schools, raising a total of $18,899.30. Recognized at the Board of Education meeting from Four Oaks Elementary was Principal Dr. Kathy Parrish, PE teacher Gardner Johnson, and 2015-2016 PTA Treasurer Becky Shearer. McGee’s Crossroads Middle had the highest total for middle schools, raising $4,214.35. Recognized at the meeting from McGee’s Crossroads Middle was Principal Dorlisa Johnson-Cowart, and PE teachers Deborah Reece and Jamie Jarman.